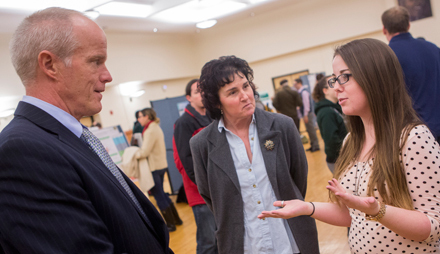 Binghamton University’s annual celebration of research is just around the corner. The fourth-annual Research Days will be held April 22-24, featuring a keynote speech, student poster sessions, laboratory visits for area students and more. This year’s theme is sustainability. “This is a great opportunity to showcase the research that is being done at Binghamton University by faculty and students, and it also gives us a chance to focus on a topic that is very important to our campus and our community,” said Donald Loewen, vice provost for undergraduate education and chair of the committee that organizes Research Days. Raj Patel, a food activist and author, will be this year’s keynote speaker. His talk, “Stuffed & Starved: The Hidden Battle for the World Food System,” will begin at 7 p.m. April 22 in the UU-Mandela Room and will be followed by a book signing. Patel, a research professor in the Lyndon B Johnson School of Public Affairs at the University of Texas, Austin, and a senior research associate at the Unit for the Humanities at Rhodes University in South Africa, holds degrees from the University of Oxford, the London School of Economics and Cornell University. He has worked for the World Bank and World Trade Organization and is now a fellow at the Institute for Food and Development Policy, also known as Food First. Today there are 1 billion people starving and 1.5 billion overweight. The U.S. is the most overweight country on Earth, and has 48 million people who are “food insecure.” In Patel’s lecture, he’ll address how this came about and what can be done to stop it. Research Days poster presentations will take place at 11 a.m. and 1 p.m. Friday, April 24, also in the Mandela Room. The events are a chance for undergraduate and graduate students from all academic disciplines to showcase their research. More than 100 students plan to participate this year, up from around 80 in 2014. In addition to these events, Binghamton faculty will again be invited to introduce students to their scholarly work during classes April 22-24. Several researchers will open their labs to area middle and high school students as well. For more details about Research Days, visit: http://go.binghamton.edu/researchdays.